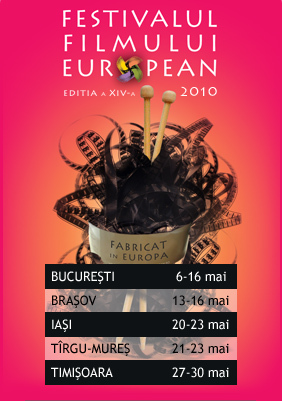 Peste 50 de filme din 28 de tari europene produse in ultimii doi ani vor anima cea de-a XIV-a editie a Festivalul Filmului European. Festivalul va avea loc in Bucuresti, Brasov, Iasi, Tirgu-Mures si Timisoara . Ambasadorul onorific al Festivalului din acest an este regizorul Radu Jude, laureat al Premiului C.I.C.A.E. la Festivalul de Film de la Berlin (2009) si al Premiului FIPRESCI la Festivalul International de Film de la Sofia pentru lungmetrajul “Cea mai fericita fata din lume”. Glumele si situatiile comice abunda; o vacanta minunata, pur si simplu idilica e pe punctul sa inceapa. Honza este un personaj agreabil si intelligent, un siret neinsemnat. Si-a pus in cap sa-i implineasca bunicului sau bolnav visul de o viata, trimitandu-l intr-o excursie. Facand acest lucru, Honza isi implineste – fara sa stie – propriul vis. Gaseste ceea ce cauta si ceea ce-si dorea. La inceput nu prevazuse asa ceva. Povestea aceasta confirma filozofia conform careia, daca nu ai habar incotro mergi in viata, cel mai bine e sa te intorci la origini. “Wingless” a fost filmat in imprejurimile Pragai. Filmul se concentreaza pe conflictul dintre liberul arbitru si soarta predestinata, conflict resimtit de individ in general. Dualismul acesta propriu naturii umane insesi este exprimat in povestire prin intermediul unui personaj fantastic intr-o descriere realista a calatoriei unui tanar, pe nume Josef, in lumea moderna. Josef, cu suflet bland si pur emotional este obligat sa se confrunte cu tentatii si in cele din urma sa poarte povara responsabilitatii si a luarii deciziilor. Over 50 films from 28 European countries produced in the last two years will delight the audience of the 14th edition of the European Film Festival. The Festival will take place in Bucharest, Brasov, Iasi, Tirgu-Mures and Timisoara. The official Ambassador of this year’s Festival is the Director Radu Jude, C.I.C.A.E. Award laureate at the Berlin Film Festival (2009) and FIPRESCI Award laureate at the International Film Festival in Sofia for the production ‘The happiest girl in the world’. Jokes and comic situations abound; a wonderful, simply idyllic vacation is about to begin. Honza is a likeable and intelligent small-time con man. He has decided to make his sick grandfather’s dream of a lifetime come true by sending him on a trip. By doing so Honza unknowingly fulfills his own dream. He finds what he’d been looking for and wishing for. He doesn’t anticipate this at the outset. This story confirms the philosophy that if you don’t know where you’re going in life it’s best to go back to your roots. “Wingless” was shot in the Prague surrounding. The film focuses on the conflict of the individual between his free will and predestined fate. This dualism, which lies in the foundation of human nature, is expressed in the story through the existence of a supernatural character within a realistic description of the journey of a young man, Josef, through the modern world, and whose tame and emotionally pure soul is forced to confront with temptations and finally carry the burden of responsibility and decision-making.